Renee is an ANNIHILATIONIST! Annihilationism is SATANISM, because it's in the interest of SATAN the DEVIL! Get saved by the Gospel of JESUS through Paul that SAVES FOREVER from burning forever in the lake of fire! And about the ninth hour Jesus cried with loud voice, saying, Eli, Eli, lama sabachthani? that is, My God, my God, why hast thou forsaken me? He said this on behalf of you and me and everyone! He knows what it feels like to be VERY DEPRESSED and GOD FORSAKEN! Just SHARE EVERYTHING with Him and make Him your BEST FRIEND! He's also the creator of our sexuality. Allow Him to teach you what is BEST for you. Read Roman through Philemon by Paul on behalf of JESUS and study the Bible, based on this foundation. J.M. de Boer with JESUS as our BEST FRIEND, we may be alone, but NEVER LONELY! Follower, And you're gonna ROT IN HELL, unless you're saved by UNDESERVED GIFT of God's GRACE through FAITH ALONE in the ATONING BLOOD OF JESUS CHRIST! 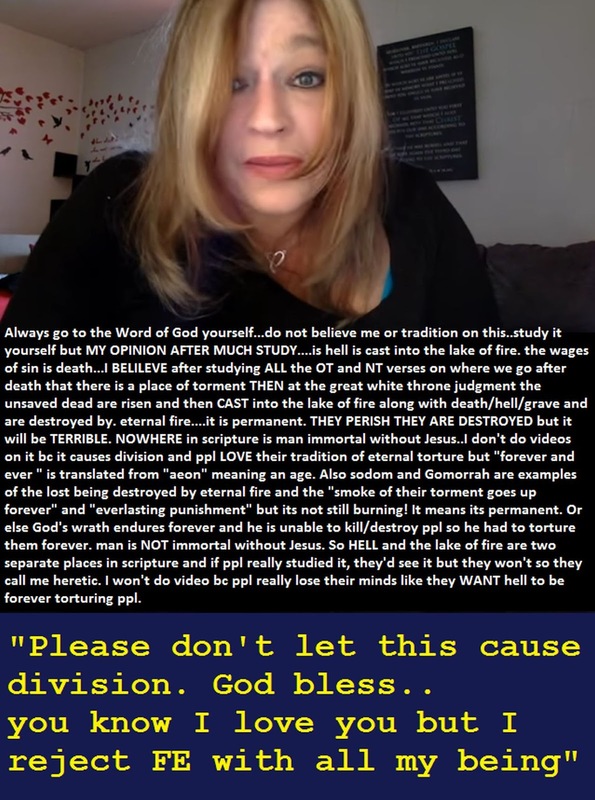 Follower, so Renee is a FALSE PROPHET, according to YOU, concerning HOW to get saved FOREVER? YOU are a SELF-RIGHTEOUS RELIGIOUS FREAK who believes in the WRONG GOSPEL! Go, and from now on sin no more." Follower, you're VERY NAUGHTY! REPENT or I TICKLE YOU TO DEATH! J.M. Judas followed Jesus and performed many miracles in Jesus' name. But Judas committed suicide and Jesus said Judas was lost: John 17: 12 "While I was with them in the world, I kept them in thy name: those that thou gavest me I have kept, and none of them is lost, but the son of perdition; that the scripture might be fulfilled." Perdition means total loss, destruction, ruin etc.. means he went to hell. But if he had repented of his wicked deeds he might have been saved.